Are you getting excited about Move-in Weekend? We are! We are looking forward to welcoming you back to campus! 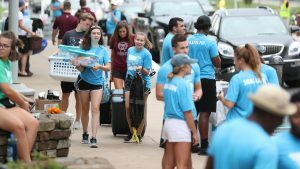 Housing, Residence Life and Dining Services has some important information for you as you prepare to move your student to Missouri State! Want to check or change your meal plan? You student can review and change their meal plan now through the first three weeks of classes. You can do so by checking my.missouristate.edu, under the campus life tab. You can review and change meal plans under the “BearPass Card Account Management” link. Our Move-in Guide is a summary of everything you will need to know to plan what to pack, information about Move-in Weekend, and some helpful tips while your student gets settled in their room, including tips about setting up technology once you get here. Click here to view the online version of the Move-in Guide. Opening weekend can be exciting and stressful all at the same time. Anticipate traffic around campus and lines for elevators as our on-campus students move in. We encourage you to stay hydrated by using our Hydration Station water fountains in the residence hall lobbies. If you have any questions or concerns about move-in, feel free to call our office 417-836-5536 or stop by during our additional office hours opening weekend.